Men and women are struggling with depression after treatment for illnesses such as cancer because there is insufficient emotional support for them, a leading Priory psychotherapist says. Julia Cole, senior psychotherapist at the Priory’s Wellbeing Centre in Southampton, said she was seeing an increasing number of people whose depression followed cancer treatment. She said many suffered from disrupted sleep, anger, stress, and fear and sometimes even Post-Traumatic Stress Disorder (PTSD). Much of the stress was connected with financial concerns and fear of the illness recurring. Sometimes personal and professional relationships had gone into freefall. Depression is a common side-effect of cancer treatment. According to the Breast Cancer Care charity, more than a quarter of patients it surveyed (26%) said dealing with chemotherapy or radiotherapy was not as hard as coping with life after being discharged from hospital treatment. Only one in 10 say they felt positive and ready to move on when treatment was over. More than half (53%) struggled with anxiety once hospital treatment had ended. 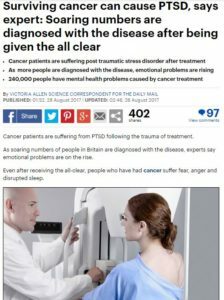 In addition, three studies by researchers at the Universities of Oxford and Edinburgh in the UK in 2014 revealed that three-quarters of depressed cancer patients were not receiving treatment for depression. Some breast cancer treatments can affect the way the ovaries work, causing an early menopause for some women. According to the World Health Organisation (WHO), depression is now the leading cause of ill health and disability across the globe with more than 300 million people suffering from it. The rate of depression has increased by more than 18 per cent since 2005, WHO said. It’s common to want to protect others from anxiety about cancer, but your family and friends can support you and help you, often in unexpected ways. Talk to the people you trust about your feelings – positive and negative. Each day write one positive thing that has happened to you or you initiated during the day. Simple things such as appreciating nature, the smile of a stranger or a meal enjoyed can help you feel life is worth living after treatment. Listen to your own needs. Don’t be afraid to rest if you need to, or be a bit more active if you feel ready. Pushing yourself to work too hard or meet the demands of others can cause low mood and stress. Think about doing one thing you have put off – a trip away, studying a subject that interests you, learning a language or seeing a film you may have missed. Aim to undertake this in the coming weeks. If you achieve your goal, set yourself another desire. Setting goals and achieving them (or at least trying) can allow you to feel less lost and more at ease in the world. Ask yourself what you learnt about yourself after treatment. You may be surprised at your resilience, or need to grieve for the change in your life. This is natural, and can help you decide what you want in the future.